Over at the documented life project, the prompt for June 13 was road less travelled. I continue to work in this book that I altered nearly three years ago in which I left certain words visible on the gessoed pages. Departure is a simple act. You put the left foot down and then the right. For the background, I painted a layer of Daniel Smith duochrome oceanic acrylic over the gessoed page. 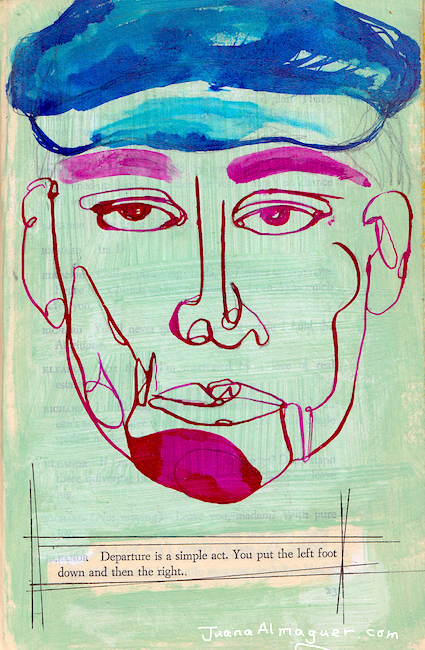 Using a dip pen and De Atramentis document inks in fuchsia and turquoise, I drew the portrait. For the page on the left side, I used Golden acrylic paint in titan buff for the background and then drew a sailboat in pencil. As I wanted to add a compass, I made my own linocut compass and stamped the image over the sailboat. 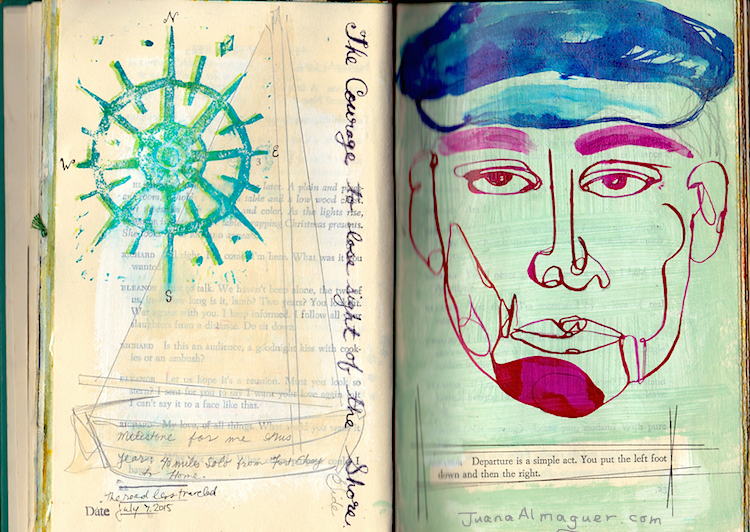 To finish off the page, I added an excerpt of Gide's quote, "the courage to lose sight of the shore." I am slowly learning how to use the De Atramentis document inks and really like how they flowed over the acrylic background on the page on the right. Next, I'm going to experiment with using them to mix colors. Do you have any favorite color mixes? I love the portrait and the sayings that you chose as well. Sometimes the easiest and the hardest things to do is to take that first step. But when we do there is no telling what adventures we can have. What wonderful pages Juana! I love the way the lines flow. I love nautical themes. Your Captain and sailboat, compass are outstanding. That face says it all. Strong, determined, ready to travel the world. This is really a very cool journal page and I love the quote! The portrait looks great! Creative recycling and lovely artwork ~ love the style and colors!